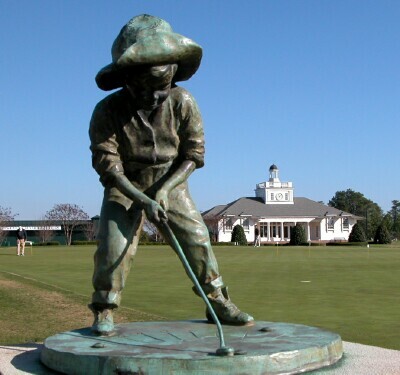 “Golf Lad, commonly known as Putter Boy is an icon around Pinehurst Resort . . . so much so that he is the resort’s official logo. When the resort first opened in the late 1800’s there were advertisements featuring a young boy playing golf which sculptor Lucy Richards used as inspiration when she created the iconic 2 foot statue back in 1912. While the advertisement drawings may have inspired Putter Boy himself the stance and grip he uses, according to legend, is that of famed golf course architect and Pinehurst resident Donald Ross. Originally called Sundial Boy the statue was relocted to the putting green area in the 1970s and the name Putter Boy stuck. Having been moved to a variety of locations over the years Putter Boy is now located near his originally intended spot between the putting green and the practice area. Click HERE to return to the Pinehurst North Carolina Travel Guide.